Issa Rae, creator and star of HBO’s “Insecure,” at the 69th Primetime Emmy Awards, September 2017. Variety. 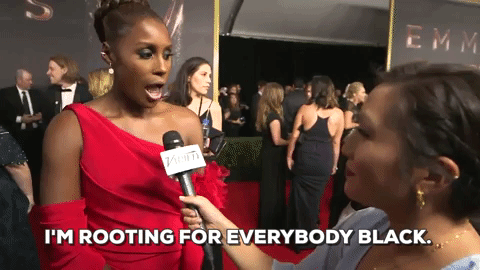 At the 69th Annual Emmy awards held on September 17, 2017, Issa Rae, creator and star of HBO’s widely popular television show “Insecure,” responded to a red-carpet question by proclaiming she was “rooting for everybody Black!” Rae’s comments, which went viral, articulated a sense of collective excitement about the growing recognition and achievements of African American Emmy nominees at the award show. Her comments also alluded to broader reflections about Black identity across the diaspora, the varied places that African descended peoples call home, and a collective spirit of resilience despite the considerable challenges facing Black communities. At the same time, Issa Rae’s declaration can also be understood within the broader context of increasing discussions around anti-Black racism and the heightened policing and incarceration of African descended peoples globally. For scholars of Black Canadian history, similar concerns surrounding the collective mobilization and activism against anti-Black racism continue to mark our discussions about identity and belonging to the nation. During the month of February in particular, scholars of Black History in Canada are invited to rethink the frameworks of what it means to “root for everybody Black” as they work to fight against the historical erasures and silencing of their communities. While there still seems to be much debate around whether or not Black History month is still relevant, or if it serves as a superficial acknowledgement of Black achievement in North America, I argue that there is much subversion in the collective response of “rooting for everybody Black”. This concept can be used as an entry point to discuss what it means to be Black in a society where racial equality stands as the marker of Canadian identity despite systemic and institutional barriers facing diverse racialized populations. For me, “rooting for everybody Black” can be understood as a political act given the trajectory and experiences of African descended peoples in Canada. That in fact, “rooting for everybody Black” can become a political necessity when considering the national silencing of Canada’s long history of racial indifference and separation. To understand the complexity of Black Canadian history and why rooting for everybody Black becomes an important statement of identity and political affirmation, we must begin by examining the myth of Canadian racial equality and how it structures Blackness within broader national narratives. Within this mythology stands the idea that it was only south of the border where Blacks were subjected to violence, denied their citizenship rights, and forced into residential and educational ghettoes. The popular saying, ‘at least we’re not as bad as the United States’ is a consistent and important talking point when comparing the histories of African descended peoples in Canada and the United States. And yet, scholars of Black Canadian history highlight the contradictions of this mythology and argue that Blackness in Canada has and continues to reflect parallel experiences of enslavement and racial separation. What this has translated into is a historical silencing of the long-standing contributions and presence of Blacks in Canada. As a result, much of our understanding of Black historical figures in Canadian society still seems to be deeply rooted in conceptions of the North Star and the Underground Railroad. We often remember Harriet Tubman from our elementary and high school education, or think about Mary Ann Shadd Cary, who became the first Black woman in North America to publish a newspaper, The Provincial Freeman. The history and contributions of these leaders are indeed important and crucial for helping us understand the complexity of Black identities in Canada. However, the lives and experiences of Black Canadians tells us far more about enslavement, racial separation and indifference that often disrupt ideas of racial equality intended to promote positive national discourses. It is within these broader conversations that the political necessity of “rooting for everybody Black” and the importance of Black History Month become so relevant; these stories create ruptures in the Canadian national narrative that focus not only on the celebration and achievements of African descended peoples but they explore the context by which they lived. Accordingly, when Issa Rae highlighted the rising number of African American actors, writers and directors at the 2017 Emmy awards, she did this within the racially divisive climate of Trump’s America and the rise of white supremacist organizations and rallies across the nation. As a result, the power and subversive nature of Black History Month and “rooting for everybody Black” is not only in the (re)telling of Black stories, but in the exploration of the context by which Blackness has been situated in Canada. This act of “rooting for everybody Black” can disrupt the dominant myths of Canadian racial equality and instead highlight the complex series of negotiations between belonging and exclusion that mark Black Canadian experiences. From a historical standpoint, the significance of “rooting for everybody Black” can be explored in the ways it reveals both continuity and change in the Black Canadian historical experiences. To illuminate this, I will highlight specific examples in the historical and contemporary contexts to tell us what they reveal about Black Canadian history. For example, there is the story of Sophia Pooley, an enslaved woman of African descent owned by Joseph Brant, who migrated to the Burlington/Hamilton area in the late 1700s, along with his Black and Indigenous slaves. It is believed that Brant owned over thirty slaves and purchased Pooley at the age of seven, and later sold her when she was twelve. Pooley’s story was published in Benjamin Drew’s, A North-Side View of Slavery. The Refugee: or the Narratives of Fugitive Slaves in Canada. Related, and described her experiences with Brant’s children and Indigenous wives. Pooley’s life reveals stories of the dispossession, colonialism and processes of racialization that force us to rethink the historical connections between Blackness, Indigeneity and Black Indigeneity. The continuities of these relationships continue to exist as scholars work to illuminate and complicate Black and Indigenous relationships in Canada. Indeed, the role of mixed race identities within broader conversations of settler-colonialism, posit us to review the destruction of Indigenous people’s relationship to the land and its connection to the forced labour of enslaved Africans on the land to construct a white notion of Canadian nationhood and citizenship. 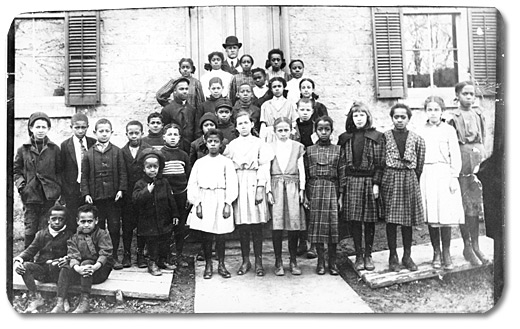 Students of King Street School in Amherstburg, Ontario with their teacher, J. H. Alexander, [ca. 1890s]. Alvin D. McCurdy fonds ; Reference Code: F 2076-16-7-4; Archives of Ontario, I0027815. The legacies of these experiences do not end with discussions of Canada’s history of enslavement. When we think about Blackness and education, it is also important to remember that Canada had its own segregated schools that were based on religious and racial separation. For example, the Common School Act of 1850 legalized the establishment of separate schools for Protestant, Roman Catholic and Black families in the 19th century. Separate schools existed in areas like Niagara, St. Catharines, Dresden and Colchester, where the last segregated school didn’t close until 1964 — ten years after the historic Brown v. Board of Education of Topeka (1954) case was won in the United States. The legacies of these separate schooling institutions would represent the educational experiences of many Black Canadians and structure the historical erasure of Blacks within the Canadian curriculum that continue until the contemporary moment. So much so that the opening of Toronto’s Africentric Alternative School in 2009 sought to challenge these historical silences and address the achievement gap that Black students were facing in the city. In many ways, in order to understand the need and creation of Toronto’s Africentric school, we need to understand the historical silences it proposes to speak to. Working to create an African-centred community and place of learning, the school seeks to document best practices and follow students’ academic achievements. Educational advocacy remained at the core of Black experiences in Canada and was challenged at all academic levels. When we remember the Sir George Williams Affair which occurred on January 1968, the foundations of Black radical activism are apparent. After six Caribbean students accused their biology professor, Perry Anderson, of practicing racial discrimination by giving them failing marks, students occupied the computer center of the school for several days culminating in a full-on riot at the school. By the time the riot was over, 97 people had been arrested, including both white and Black students, and over $2 million dollars worth of damage was done to the university. Standing as the largest student uprising in Canadian history, the Sir George Williams affair led to demonstrations across several Caribbean countries and galvanized Montreal’s black community in building cultural organizations and advocating for educational reform in the city. It’s hard to think about this historical moment without drawing connections to the advocacy work of organizations like Black Lives Matter Toronto, whose activism seeks an intersectional approach in challenging anti-Black racism in the government and policing of Toronto. The organization’s emphasis on building solidarity with Black communities seeks to dismantle all forms of state-sanctioned oppression, violence, and brutality committed against African descended peoples. The organization most recently received media attention after members stalled the Toronto Pride parade in the summer of 2016. Similar to the experiences of 1968, BLMTO disrupted the peaceful constructions of racial equality in Canada and forced many to reassess the parameters of inclusivity and safety within the city. It is in these moments that I believe “rooting for everybody Black” calls us to rethink and consider the environments that situate Black Canadian experiences. 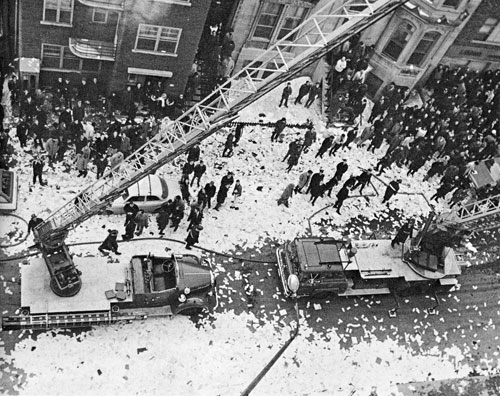 Computer cards rained down on the streets during the Sir George Williams Affair in Montreal, February 1969. Concordia Archives photo via National Film Board of Canada website. In addition, as Canadians celebrate the new face on the nation’s ten-dollar bill, Viola Desmond is remembered as a Canadian civil rights icon who took a legal stand against segregated movie theatres in Nova Scotia. While Desmond did not win her court case, we celebrate her legacy as one where she fought a social climate in Canada that fostered racial prejudice and segregation. In remembering the importance of Viola Desmond’s case, it is hard not to reflect on the collective excitement that Blacks across the diaspora are feeling after the box office opening of the Marvel film, Black Panther. The all-black cast and fictional nation of Wakanda highlight notions of African modernity and technological advancement that stand as a far cry from popular culture representations of Africa as a colonized continent in economic disarray. It is here that “rooting for everybody Black” can also represent articulations of Black identity and representation in Canada; to remind us of where we have come from and where we are going. As Black History Month comes to a close, we must also remember that “Rooting for everybody Black” also stands as a phenomenon that crosses national borders and boundaries. In many ways, it is a naturally diasporic act because of the ways it speaks to a global problem of anti-Black racism that is not exclusive to the United States. It is in part, a way of understanding how these stories are interconnected and shaped by experiences of difference and exclusion. Black Canadians understand themselves within dominant discourses that seek to silence their presence, their historical legacies and contemporary activisms. These stories, both celebratory and critical, serves to remind the nation that Black Canadians have a long and complicated history with the land even as they have helped to shape the contours of the nation. Funke Aladejebi is an assistant professor in the department of Gender and Women’s Studies at Trent University. Constance Backhouse, Colour-coded: A Legal History of Racism in Canada, 1900-1950 (Toronto: Osgoode Society for Canadian Legal History), 1999. James St.G. Walker, Racial Discrimination in Canada: The Black Experience, Canadian Historical Association Historical Booklet, No. 41 (Ottawa, 1985), 6-7. See: Robin Winks, “Slavery, the Loyalists, and English Canada, 1760-1801,” The History of Immigration and Racism in Canada, Barrington Walker, ed. (Toronto: Canadian Scholars’ Press, 2008); James W. St G. Walker, The Black Loyalists: The Search for a Promised Land in Nova Scotia and Sierra Leone 1783-1870 (Toronto: University of Toronto Press 1992); Kristen McLaren, “We Had No Desire to be Set Apart: Forced Segregation of Black Students in Canada West and Myths of British Egalitarianism,” Social History/Histoire Sociale Vol. 37, No. 74 (2004): 27-50. Benjamin Drew, A North Side View of Slavery: The Refugee: or the Narratives of Fugitive Slaves in Canada. Related by Themselves, With an Account of the History and Condition of the Colored Population of Upper Canada (Boston and New York, 1856). Zainab Amadahy and Bonita Lawrence, “Indigenous Peoples and Black People in Canada: Settlers or Allies?” in A. Kempf (ed. ), Breaching the Colonial Contract: Anti-Colonialism in the US and Canada (New York: Springer, 2009):105-136. Funke Aladejebi, “’I Didn’t Want to Be Anything Special. I Just Wanted to Teach School’: A Case Study of Black Female Educators in Colchester, Ontario, 1960,” Southern Journal of Canadian Studies 5, nos. 1–2 (2012), 146-159.